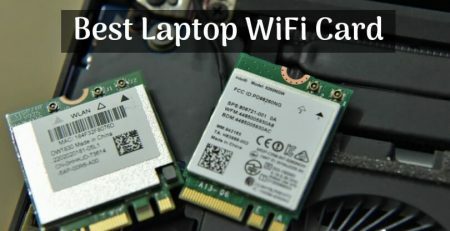 While we live in the wonderful world of Wi-Fi, there are times when we require LAN cable to connect to the Internet. However, a few of the latest laptops do not come with that provision. Does that mean you must suffer while the Wi-Fi comes back on? Not really. 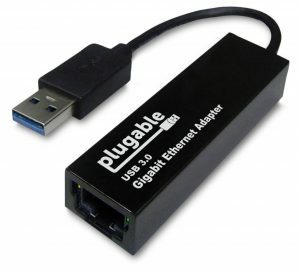 Easily one of the most popular options out there, the Plugable adapter is compatible with Windows 10, Mac OS, Linux, Chrome OS, and Nintendo Switch. The brand says that it provides the fastest USB 3.0 + Gigabit solution. You can use it to add wired gigabit to your MacBooks, notebooks, or UltraBooks. It is an extremely useful device for adding network interfaces and transferring files through Ethernet. You cannot use it to connect the printer or anything similar to the network. It theoretically supports transfer speed of up to 5 GBPS. You can use it on a USB 2.0 port, but the speed will suffer. Through USB 2.0 you will only get up to 480 MBPS theoretically. It also works with 1.1 hosts. Keep in mind that it is not compatible with Windows Mobile Systems and ARM-based Windows RT. It is also incompatible with Android devices. The product comes with driver disc for Windows, Linux, and Mac. The drivers install automatically. If it is from Amazon itself, we can rest assured that the product is going to be good! Reviewers on Amazon agree. 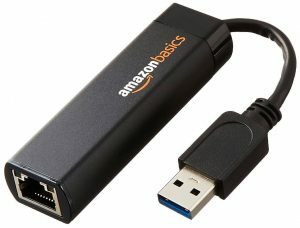 The Amazon Basics USB to Ethernet adapter comes with a wake-on-LAN function. It is also energy efficient. 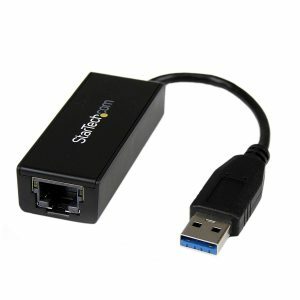 You can use this to connect your laptop to a network switch, modem, or a router. It is compatible with Windows 10/8.1/8/7, Mac OS, and Chrome OS. Some Mac users reported issues with compatibility, but the company says that this should be resolved after downloading the latest drivers. It is not compatible with Android and Windows RT. It provides speeds of up to 640 MBPS. You cannot use it to connect a printer to the Internet or the local network. 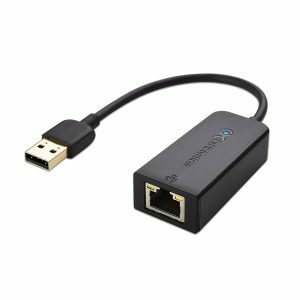 The Cable Matters USB 2.0 to Ethernet adapter is lightweight and comes with multiple supported features such as Wake-on-LAN, Half-Duplex Ethernet, Full-Duplex Ethernet, and Auto-correction. It is a simple plug-and-play adapter, and for most computers, you don’t need any drivers. If your device requires drivers, though, you can download them from the official Cable Matters website. The company guarantees that this adapter will give 100 MBPS speed at least. It is the perfect option for HD video streaming, gaming, video conferencing, file transfer, and more. Supported features also include Backpressure Routing and Crossover Detection. It has diagnostic LED indicators that help you verify the data transfer and connection status. It is compatible with Windows, Mac OSX, and Chrome OS. It is incompatible with Android, Windows RT, Nintendo Switch, Xbox, Play Station, and Streaming Box. It is compatible with IEEE 802.3 and IEEE 802.3u. The quick start guide gives you all the information you need about the device. Built for maximum portability, the StarTech adapter is compact and lightweight. If you are looking for an adapter that works with your Nintendo Switch, your search ends with this one! Most adapters are not compatible with it, but the StarTech adapter is your buddy in this case! It is powered from the USB ports directly to ensure versatility. It has activity and link LED indicators. It is compatible with IEEE 802.3, 802.3u, and 802.3ab. Even though it is USB 3.0, it will work fine on USB 2.0. However, you will have to compromise on the speed. The device has drivers for Windows and Macintosh. It also offers Crossover Detection and Auto-Correction. It comes with built-in Checksum and Large Send Offload support along with Jumbo Frames, which help conserve resources of the system being used. The company offers free lifetime technical support and 2-year warranty. The makers proudly announce that the Anker adapter is seriously compact. It is, in fact, smaller than a finger and is extremely lightweight. 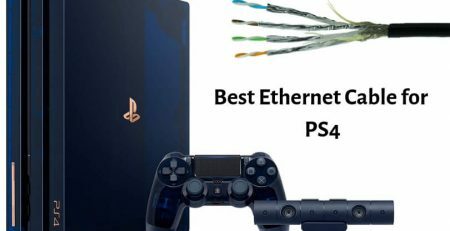 The connection is stable and quick, ensuring that you do not have to worry about buffering or loading time. The adapter definitely looks nice with an aluminum unibody, which prevents damage that is often caused due to repeated plugging in. It has no screws or seams. The brand says that it uses industry-leading technology to bring us the best device possible. You can enjoy the speed of up to 1 GBPS with this device. The company offers 18-month warranty for the Anker adapter. It is compatible with Windows XP, Windows Vista, and Mac OSX. You may find that the price is a little more than its counterparts, but users say that the handiness and portability are worth the tag. Whether we like it or not, at some point we will need a USB LAN adapter, especially when we want to transfer big files or get much better speed than what the Wi-Fi typically provides. 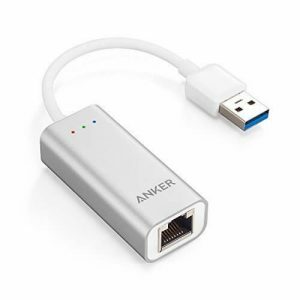 To avoid hassle and trouble in such times, it is best to have a USB to Ethernet adapter handy. This is our list of the best in the market today. Do you have any that we may have missed? We would love to hear from you!